I realize that I'm pretty late to the game with this review, but I have to admit that I didn't pick this up before now because I wasn't really sure how many of the shades were going to work for me and I didn't want to buy a palette that I wasn't sure I'd use. 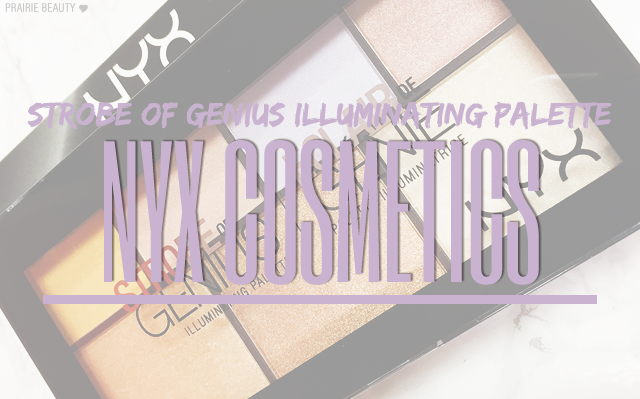 I was actually lucky enough to win the NYX Strobe Of Genius Illuminating Palette in a blog giveaway recently and I was really excited to finally get to try it out. I'd heard mixed reviews about the palette and was eager to form my own opinion - especially since I've finally jumped on the highlighter bangwagon only recently. 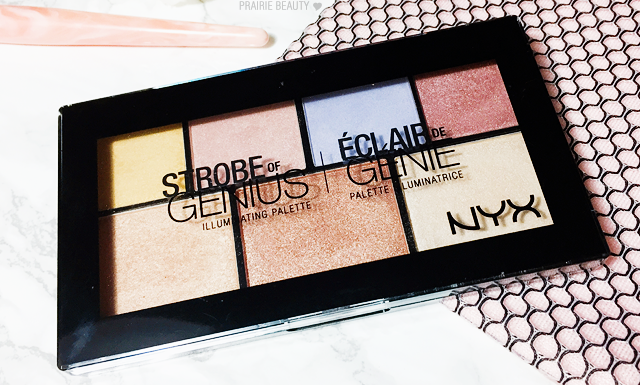 I know this palette has been out for over a year - but I still wanted to review it from my perspective since I'm sure there are a lot of people who, like me, aren't quite sure if it's worth it for them. 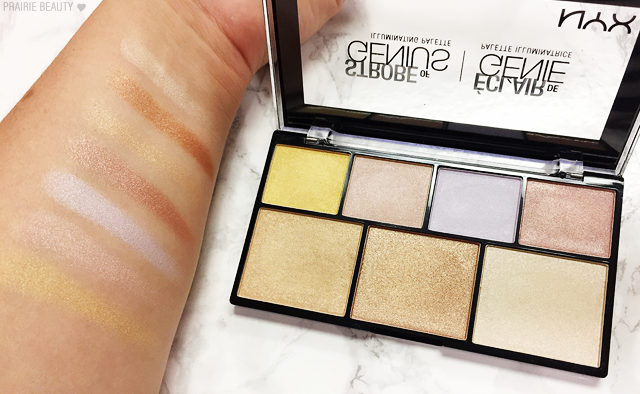 Introducing the Strobe of Genius Palette, our incredible new collection of must have illuminators designed to give you everything needed to achieve today’s most buzzed about highlighting trend: Strobing. 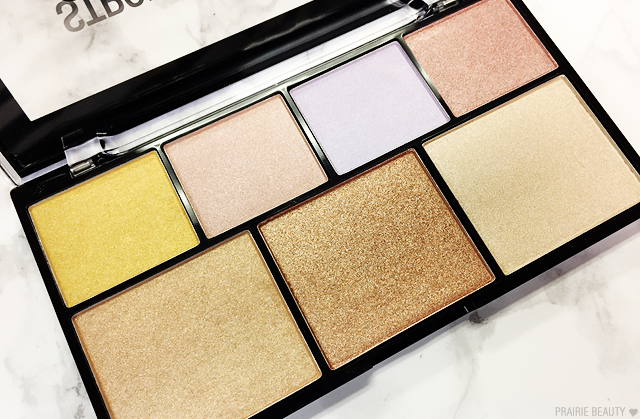 This breakthrough palette features seven velvety-smooth shades that will enhance your features with serious levels of illumination. The best part? Mastering the look is easy—all you need is a little extra natural light. 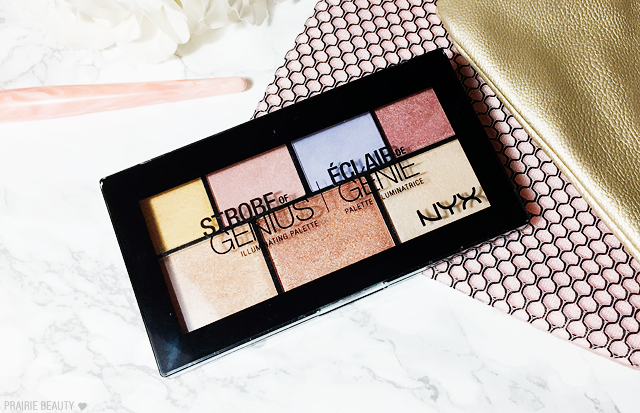 As drugstore highlighters go, I have to say that I think NYX is really the only brand that I've seen bringing a selection of different tones to the table, and I think that's definitely clear in this palette. Along with your traditional highlighting tones, this includes a beautiful lavender, a rose gold and a very bold golden yellow, which are shades that I've really only seen otherwise in higher end highlighting products. 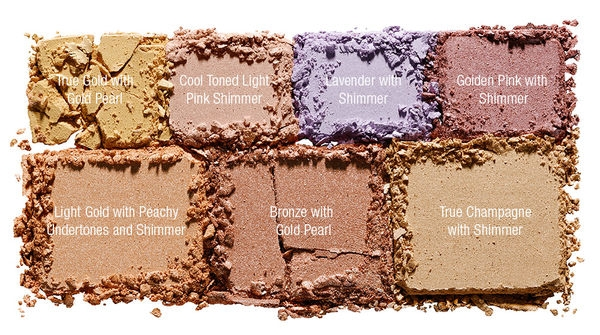 I quite like the layout of the shades, with the more unique shades in smaller pans along the top while the more traditional shades are in larger pans along the bottom. Let's be honest, most people are going to reach for more natural tones much more often than they'll reach for the edgier, more unique shades, so I think NYX was smart in this. Because I have fair skin, I feel like I should tell you which shades work on my skin tone - because obviously it won't be all of them. That's one issue that I have with larger highlighting palettes, because highlighters that are too deep or too golden end up looking dirty and strange on my skin. Cool Toned Light Pink Shimmer, Lavender With Shimmer, and True Champagne with Shimmer work beautifully on my skin. I can also make Light Gold with Peachy Undertones and Shimmer work on my skin, as long as I'm bronzed. The rest of the shades, I think, are more suited to deeper skin tones than my own. True Gold With Gold Pearl - This is the dud of the palette in my opinion. I find the shade to be a little bit strange, personally, and I think the formula just isn't up to part with the rest of the palette. It's not as smooth and pigmented as the others. Cool Toned Light Pink Shimmer - I can already tell this is going to be a winter shade for me, because this icy pink is perfect for cool toned fair skin. With a little bit of summer tan on my face, this is a more natural look at this time of year but still really quite pretty. Lavender With Shimmer - This is another winter shade for me - and one that's a little bit out of my comfort zone. Somehow, though, the blue undertones in this look really pretty on the skin and I think with a pretty cool toned look this is going to be great. I also think this has the smoothest formula, with more glow than shimmer to it. Golden Pink With Shimmer - This is a GORGEOUS rose gold shade, but just doesn't work as a highlight on my skin tone. I haven't tried it as a blush topper yet, but I suspect I can make it work in that way. On deeper skin tones, though? I feel like this has to be a stunner. Light Gold with Peachy Undertones and Shimmer - I have a feeling this will be a lot of people's favorite, since these pale gold types of shades are so overwhelmingly possible. I think that people with warm tones of a wide range of depths will find this one really, really flattering. Bronze with Gold Pearl - I feel like there just aren't enough options for deep skinned girls in the drugstore, but this shade will be absolutely gorgeous on deep to very deep skin tones. It's just gorgeous. In my life, this will likely become an eyeshadow. True Champagne with Shimmer - Because I'm boring, this is clearly my most worn shade in this palette. It's got a really creamy vanilla tone to it and gives a nice glow to the cheekbones without being over the top. 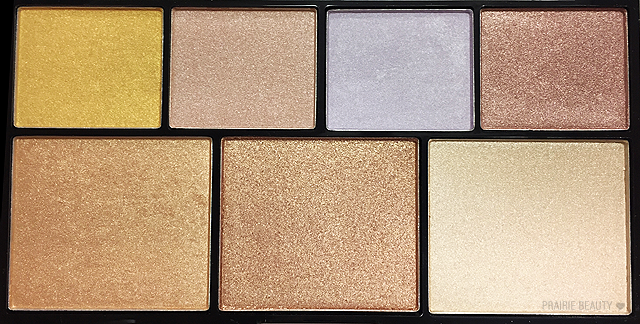 While there are so many more interesting shades in this palette, I feel like this one is always going to be the one I'm most likely to reach for. So, is it worth it? I really think it is. I think the formula on these powders is really, really good and the wide range of shades will not only suit a lot of different skin tones - I really do think there's literally something for everyone in this palette - but it also provides some variety for different types of highlighter looks without having to buy a more expensive, high end palette. I like the idea of more affordable options for looks that aren't going to necessarily be every day go to's, especially when it does include a more basic shade for every skin tone. If you're like me and have been unsure about this, I'd definitely give a thumbs up to picking it up!